Hi, it’s Stephanie here with an incredibly tasty vegetarian spring side dish perfect for your Easter table or just when you want to eat something really spectacular. These Cooked Radishes in Miso Butter are special and will definitely get everyones’ attention. I have two very important words for you that in my opinion should always go together… Miso… and… Butter. OMG people! I would literally take a bath in a tub of this heavenly stuff. This awesome and versatile compound butter elevates almost anything it touches including fish, chicken, steak, pasta, veggies and so much more. In this recipe the miso butter is stirred into radishes that have been braised and glazed with honey until they are just tender and subtly sweet. I have always wondered if you can cook radishes. And boy oh boy I found out that YES you definitely can! 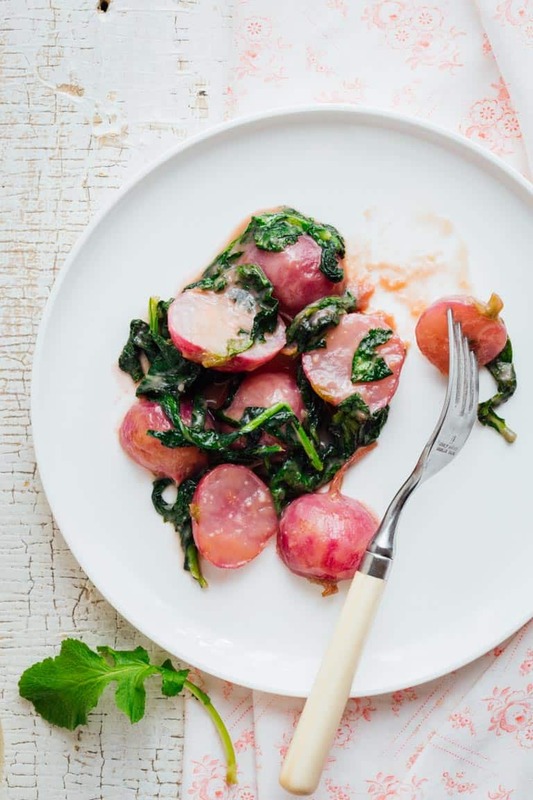 The radish greens are added at the end to give this simple and elegant dish brightness and texture. It is definitely much more than the sum of it’s humble five ingredients. 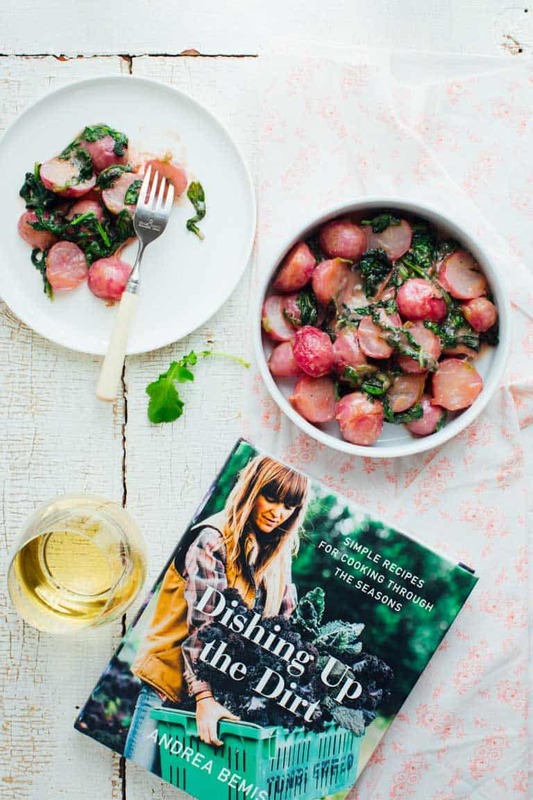 These Cooked Radishes in Miso Butter have been adapted from a new cookbook by Andrea Bemis called “Dishing Up the Dirt.” Andrea is an organic farmer in rural Oregon and has a food blog by the same name. This lovely cookbook takes seasonal cooking to the next level. The recipes are literally organized by the seasons. Andrea’s love of food and cooking developed as she learned to farm, so vegetables are the star of the show in most of her recipes. And the stars are treated with great respect and a light hand. 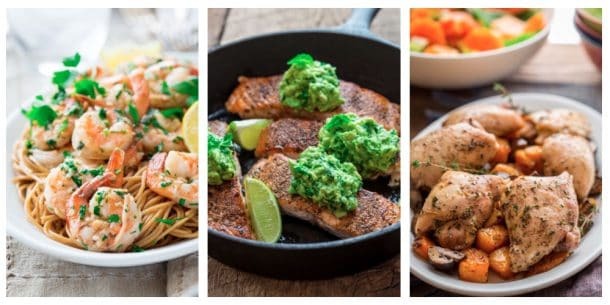 When you’re cooking with seasonal ingredients that are at the peak of freshness and flavor you don’t need to drown them in a bunch of other ingredients to make them taste good. Andrea embraces this concept wholeheartedly. Most of her recipes are simple with just a few ingredients and easy preparations, but all of them are elegant enough to serve to guests. I can’t wait to try her Grilled Romaine with Dijon Tahini Dressing and Fried Capers, Burst Tomatoes and Cashew Ricotta Tartine and her Roasted Cabbage with Bacon Gremolata (Bacon gremolata?! Seriously sounds so awesome, right?!). 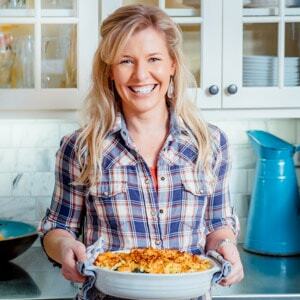 Andrea’s cookbook really has it all… amazing recipes, pretty pictures and great stories about her life on the farm. It’s not only a good read, but also a real cookbook that I know I will use again and again. These Cooked Radishes in Miso Butter have been adapted from a recipe in Andrea Bemis’ cookbook Dishing Up the Dirt. They are an incredibly tasty vegetarian Spring side dish perfect for your Easter table. Stir together the miso and 3 tablespoons butter. Separate greens from radishes and roughly chop the greens; set them aside. Slice the large radishes in half and smaller radishes keep whole. Add the radishes to a skillet with 3/4 cup water, honey, the remaining 1 tablespoon of butter and salt. Cover the pan and bring the mixture to a boil. Remove the lid, keep the heat on high and cook, stirring often, until the radishes are tender and most of the liquid has evaporated, 8 – 12 minutes. Reduce the heat to low and continue to cook until the sauce has almost evaporated and is reduced to a glaze, 3 to 5 minutes. Stir in the radish greens and miso butter and cook until the radishes are golden brown and lightly caramelized, 1 to 3 minutes. Serve warm. 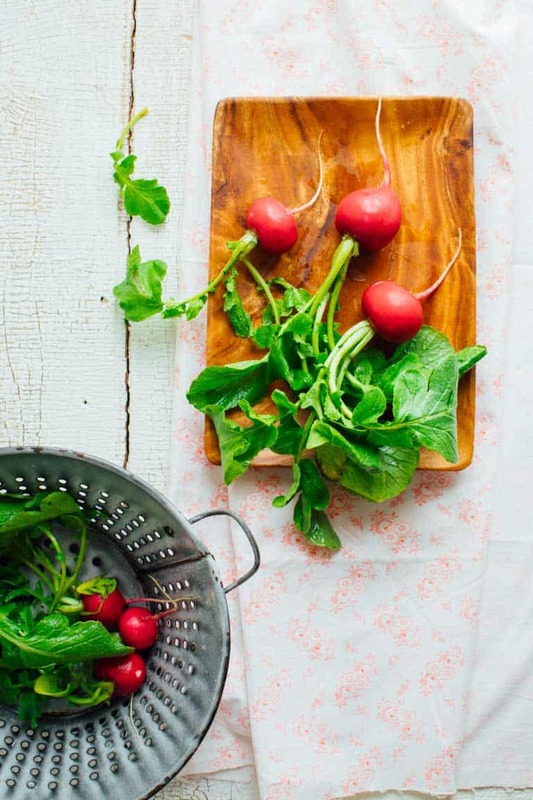 If your radish greens aren’t fresh and seem tough, substitute with another Spring green like spinach or chard. I adore roasted radishes, but miso butter? Wowser, you’ve stepped it up to another level! I love how sometimes the simple things are the most perfect! 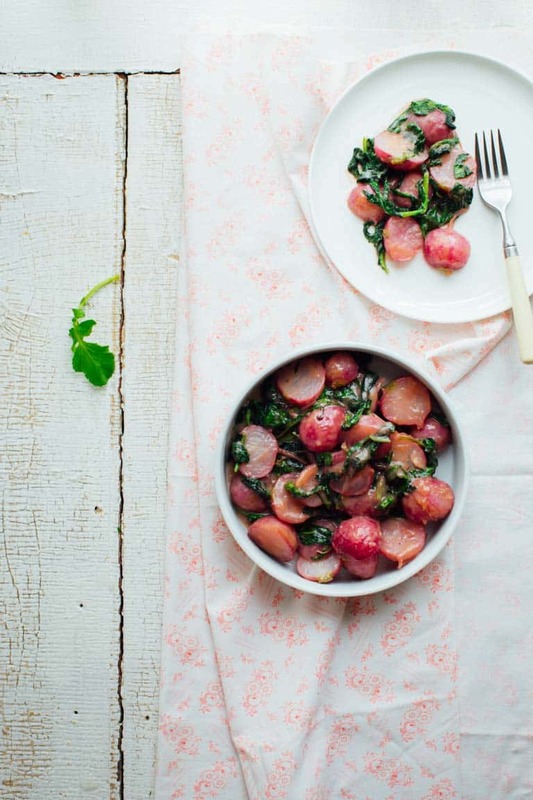 Such a great way to cook radishes! What a delicious looking side dish! Miso butter is fantastic. My husband loves radishes; I need to make this for him! 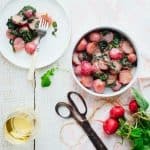 Such a interesting and delicious way to cook radishes. Thank you for sharing! I so agree about miso and butter being amazing together. You may have just found a way to get me to enjoy radishes. They’re not my favorite, but with the miso butter, how could I not like them!? Okay, this is going on tomorrow’s menu! I love radishes, butter, & miso, & coincidentally came home with a gorgeous bunch of radishes today that was totally an impulse buy. Thanks! I don’t even remember the last time I had radish. I may not have had any since before moving here to Oklahoma almost 13 years ago. I’m really interested in this recipe–especially since it utilizes the greens, too! I chickened out of buying beets last week because they still had giant, beautiful greens (and they themselves were tiny), which the recipe I had in mind did not use. It just seemed too wasteful. I love raw radish and have never thought to cook it. I can’t wait to try this! The miso butter sounds incredible and I love that you’ve also used the radish greens in the dish. This dish was phenomenal! The whole family enjoyed it. The radish loses its spicy flavor, and becomes deliciously mild. I highly recommend it. Thank you for sharing! We’re so happy you like it Sarah!